Be careful when preparing raw chicken. Salmonella poisoning symptoms may be mistaken for other types of illnesses. In the United States alone, about 40,000 cases of salmonella poisoning are reported each year. There may be many more cases which remain unreported, simply because those affected may not realize that this bacteria was the reason for their illness. Salmonella was discovered in 1906 by American veterinarian David Salmon and is a type of bacteria that lives in the intestines of a number of animals, including reptiles, birds, and mammals. Coming into contact with raw or undercooked chicken or turkey, raw eggs, or unpasteurized milk usually causes salmonella poisoning. It can also be spread through handling reptiles. If you have been exposed to salmonella bacteria, you will develop symptoms within a few hours to three days after exposure. To avoid spreading the salmonella to others, don't prepare food for other people until after you are fully recovered. Children are more likely than adults to get salmonella poisoning. The very young, the very old, and people whose immune systems have been compromised are more likely to develop a severe case of salmonella. Salmonella can be fatal; about 600 people die each year as a consequence of salmonella poisoning. Salmonella poisoning symptoms will last for several days (usually between four and seven). If you are experiencing diarrhea, make sure you are drinking fluids to avoid becoming dehydrated. IV fluids may be given if dehydration occurs. Salmonella can spread from the intestines to other parts of the body; if this occurs, antibiotics will need to be prescribed. Young men (between the ages of 20 and 40) are most at risk of developing Reactive Arthritis. Women can and do develop Reactive Arthritis, but, as a rule, their symptoms tend to be less severe than those experienced by men. Being prescribed antibiotics does not affect whether a person will develop Reactive Arthritis after having salmonella poisoning. Make sure that eggs and poultry products are cooked thoroughly before you eat them. Hamburger meat should also be cooked thoroughly before eating. If you order a hamburger in a restaurant, ask for it to be cooked "well done." If the burger arrives at your table and is still pink, don't hesitate to send it back to the kitchen. Don't drink raw (unpasteurized) milk. When you are working in the kitchen preparing raw meat or poultry, the counter, cutting board, plates, and utensils the meat has been sitting on all need to be washed with soap and water immediately. Don't put other food items on a plate where you have placed raw meat. Wash your hands with soap and water after handling raw meat or poultry. If you are pregnant, consider breastfeeding your infant. Salmonella poisoning may be caused by contaminated water, and breastfeeding eliminates this risk for babies. Be aware that some home made salad dressings, cookie dough, frostings, and raw cake batter may contain raw eggs; don't eat these items. 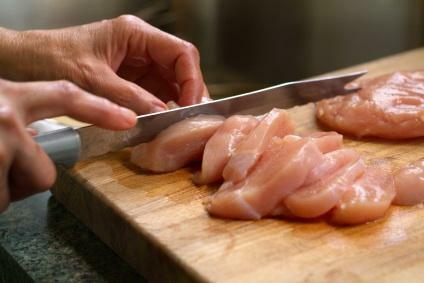 The Centers for Disease Control (CDC) monitor reported cases of salmonella poisoning and helps the State Health Departments to investigate the source of the outbreak. For more information about salmonella and similar illnesses, visit the Centers for Disease Control website.